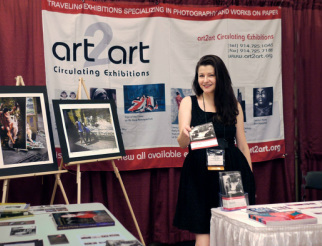 art2art Circulating Exhibitions was born out of a series of conversations among curators, collectors, artists, and dealers, most of whom share a professional and personal commitment to fine-art photography and/or works on paper. Chief among our concerns was the shortage of high-quality loan exhibitions that are accessible to regional museums, university art galleries, and other small or mid-size public institutions – or to larger institutions seeking smaller shows. art2art Circulating Exhibitions was formed to address this need in the museum community. Our shows have spanned the entire history of photography, and occasionally works on paper and other media. Not only are they priced attractively, but in light of differing space requirements they range in size from two dozen to over 100 works; after all, bigger is not always better! Our continuing search for fresh material leads us to source the shows from a variety of generous and flexible lenders, including artists and their dealers, private collections, estates and foundations, and institutions that do not have their own in-house touring facility. Our commitment to quality and accessibility is bolstered by the strong educational component to our shows. Quality, accessibility, and educational outreach: our touchstones. We look forward to working with you!